Home » Technology » Should You Buy The $99 PC From Walmart? Should You Buy The $99 PC From Walmart? The Nextbook 8, a PC tablet that runs the latest version of Microsoft Windows, will be available for just $99 on Black Friday at Wal-Mart (WMT). It is currently selling for $149. There are some tradeoffs to buying a $99 Windows PC tablet — it has no built in mouse or keyboard, the processor isn’t great, and it only has 16 GB of memory. But the good news for consumers is that PCs are hitting bargain basement prices across the board. 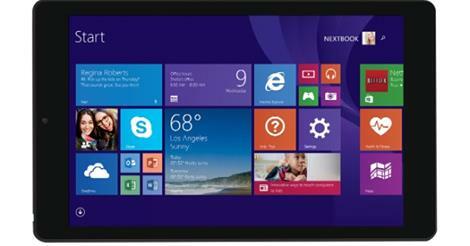 The average selling price for Windows PCs during the last three weeks of October was $430, according to NPD. That’s the lowest pricing for Windows computers in history. Prices were about 10% higher during the same time last year. Those super-low prices are helping drive moribund PC sales significantly higher. PC sales were up 16% over last year in the first week of October, all driven by sub-$300 PCs, NPD said. Microsoft(MSFT, Tech30) has been subsidizing some PC prices to make them more competitive against Google’s Chromebooks. Google’s (GOOGL, Tech30) laptops only connect to the Web, but the increasingly popular devices can be had for as low as $150. Meanwhile, Apple (AAPL, Tech30) took its highest share of the U.S. PC market in its history last quarter, after it sold 5.5 million Macintosh computers. But NPD’s Baker notes that Microsoft might be shooting itself in the foot with its extremely aggressive pricing. Sales of Windows laptops that cost more than $300 have fallen 10% in the past three weeks. That means fewer customers are buying the more expensive touchscreen laptops and tablet/laptop hybrids that make Windows products stand out from the competition.